The Fleece Inn’s barn is a unique and intimate venue for your ceremony. 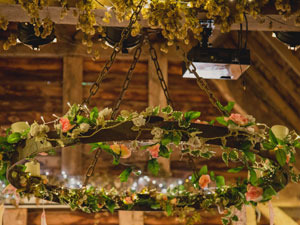 The hops that line the timber beams are entwined with lights; a truly magical setting for such a special occasion. The transformation post ceremony for your wedding breakfast and reception is outstanding; with such a huge amount of character this venue suits the minimal informal look as well as the creative and extravagant. 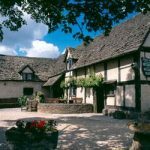 Ingredients from our extensive menus are sourced locally and as a traditional English pub we stock a large range of real ales and farm ciders, one of which is made on the premises. 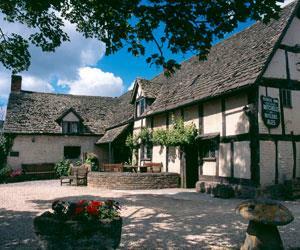 The grounds of The Fleece are the perfect setting for those all important photographs; the apple orchard, well groomed gardens and courtyard are lovely places to enjoy reception drinks with your guests. During cooler months the open fire basket and tree lights are an enchanting sight. With ever growing experience in catering for weddings of varying sizes, styles and budgets we pride ourselves in offering something for everyone. This unique venue will certainly impress your guests! Wedding receptions start at £575 with packages tailored to suit your individual requirements. From simple rustic charm to extravagant marquees, let us help you to create a truly magical day to remember.Please contact us to arrange to view our medieval thatched barn and discuss your special day in more detail.